Peggy Trowbridge Filippone, licensed to About.com, Inc.
No matter the variety you choose, crab is available in two forms--whole and picked meat. Whole crabs are sold both alive as well as cooked. The crab meat is found raw, frozen, cooked and canned. 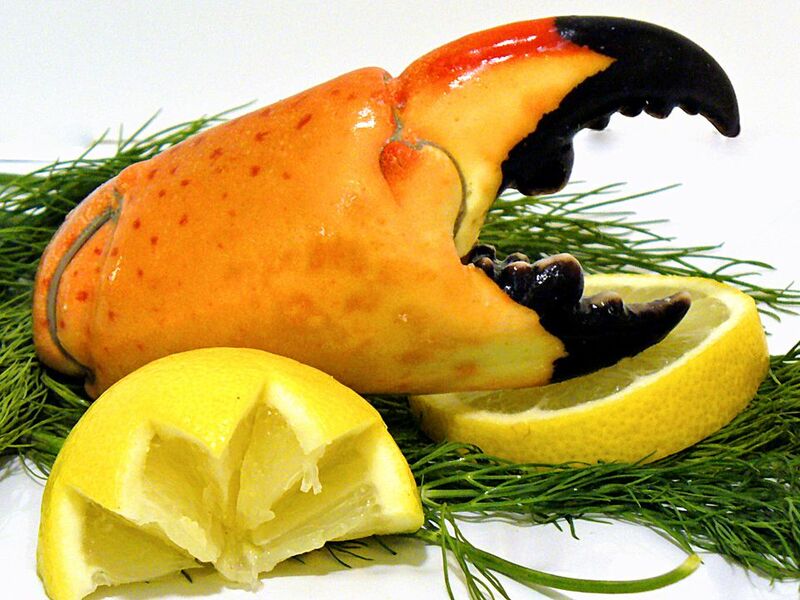 You will find the picked meat labeled as "lump," meaning large pieces, "flake," signifying smaller pieces of meat, and "claw," which is obviously meat from the crab claw. Your best bet is to purchase live crabs whenever possible (some types of crab are available only certain times of the year). The crabs should be alert and brandish their pinchers when poked. Soft-shell crabs should be translucent and completely soft. Live crabs should have a fresh saltwater aroma; avoid those that smell sour or extremely fishy. Deal with a reputable seafood provider, and let your nose be your guide. Thawed, previously frozen cooked crab should also be odor-free and defrosted only on the day of sale. Do not purchase or consume whole, uncooked, dead crabs. Count on six steamed hard-shell crabs per person or two soft-shell crabs per person. If buying whole crabs and planning to cook and pick the meat yourself, prepare for high labor with low results--the average yield for a whole crab is anywhere from 13% to 30% meat. Although more expensive, purchasing crabmeat will save you a lot of time (and perhaps aggravation). If you are purchasing canned crab, keep in mind that one 7.5-ounce can yields 1 cup crabmeat. If your recipe calls for "spring she-crab," you need to select a female crab, which is easy to do by looking at the underside of the crab. Live crabs should be refrigerated and used on the day of purchase. Raw crabmeat should also be kept refrigerated and used within 24 hours. Thawed, previously frozen cooked crab should be used within the same day of purchase. Vacuum-packed crab can be stored in the refrigerator up to one month and used within four days of opening. Canned crab is good for six months. When using canned crabmeat in recipes, it is recommended that you pick over the meat. This means to carefully sort through the meat with your fingertips to remove any bits of shell that may have been missed during processing. If canned crabmeat tastes a bit tinny or metallic, place the meat in a bowl of ice water and let it soak for five minutes. Drain thoroughly and pat dry with paper towels. To freeze crabmeat, cook the crabs and remove the meat. Pack into airtight containers and cover with a light brine (4 teaspoons of salt to 1 quart of water), leaving 1/2-inch headspace in the container. Frozen crab can be stored up to four months at 0 F.